About a year ago, I discovered the Flip Pal. I knew right away that this would be a wise purchase. I ordered one and and decided to invest in an Eye-Fi card to go with it. It was one of the best investments I’ve made. I keep getting sidetracked, but I have made pretty good progress scanning the thousands of photos I have gathered over the decades. 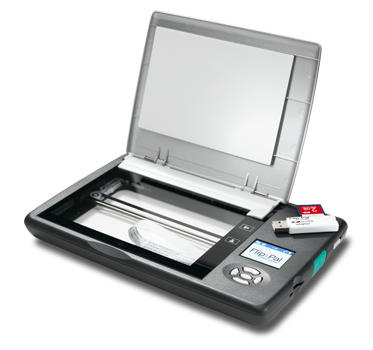 The Flip Pal is the most convenient tool for scanning that I’ve come across in years. I can sit in my living room, watch a movie and scan, scan, scan. I can easily travel with it in a little case I purchased separately. Within a few minutes, the pictures I’ve scanned hit my digital Eye-Fi folder and an email announces that I can access them for a few days. I save them to a folder on my iMac or to a Dropbox folder so I can access them from anywhere. And, if it weren’t enough to be able to scan quickly and easily, I was touched to learn that Flip Pal has a “Flip Pal Cares” team that went to hurricane-ravaged New Jersey. They scanned and posted photos found in the Hurricane Sandy debris so they won’t be lost forever. Hopefully, the photos will be united with their owners. I can’t imagine losing all my family history information and historic photographs along with all my other possessions. You’re doing a good thing here, Flip Pal. I bought mine from Amazon. I didn’t buy the case, since I thought it was a little pricey and always seem to have extra pouches, cases, and carryon bags around my house.